Western Pleasure Guest Ranch is a family-friendly working dude ranch in Sandpoint, Idaho. Surrounded by fresh mountain air and spectacular views, the farm offers lodge-style accommodations in the form of guest rooms and log cabins, gourmet cuisine, evening entertainment and a variety of amenities and activities. Guided horseback rides are offered throughout the year, along with horse-drawn sleigh rides, and upscale amenities at the ranch range from a recreation room with foosball and pool tables and large screen television, an upper deck with an outdoor hot tub, a basketball court and horseshoes, and a children’s playground. 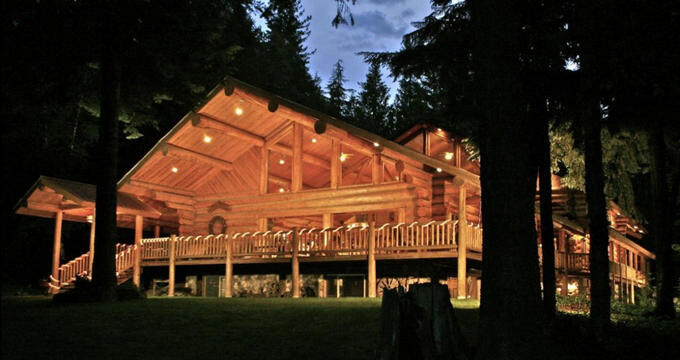 Located 16 miles northeast of Sandpoint, Western Pleasure Guest Ranch is ideally situated for a relaxing escape from the hustle and bustle of daily life or an adventurous getaway filled with outdoor activities and recreational pursuits. Western Pleasure Guest Ranch offers a variety of accommodations, ranging from deluxe guest rooms in the main lodge and stand-alone log cabins. All lodgings are spacious and airy with king or queen-size pillowtop beds dressed in luxury linens, down comforters and handmade quilts and soft pillows, and en-suite bathrooms with soaking tubs and showers, or combinations of both, single or double vanities, thick towels and bathrobes, and branded bath products. Sitting areas have plush sofas and armchairs, and wood-burning fireplaces and amenities include central climate control with cooling and heating, flat-screen televisions with cable channels and DVD players, mini-fridges, microwaves, hair dryers, and complimentary wireless Internet. Cabins offer extra levels of space with living and dining areas for entertaining and fully equipped kitchens with all the basics needed for light cooking, along with fridges, microwaves, and coffee makers. Comfortably furnished lounges have wood-burning fireplaces, ample seating and country-style décor and furnishings, while bedrooms have king or queen-size pillowtop beds dressed in luxury linens, down comforters and handmade quilts and soft pillows. En-suite or shared bathrooms have soaking tubs, and showers, or combinations of both, single or double vanities, thick towels and bathrobes, and branded bath products, and porches or decks have outdoor seating and breathtaking views of the surrounding mountains. Three meals are served a day in the Great Room and include freshly prepared ranch-style, gourmet cuisine for breakfast, lunch, and dinner. Ingredients are locally sourced and always as fresh and natural as possible. Breakfast includes coffee, tea and hot beverages, fresh fruit and juices, cereals, granolas and yogurts, egg dishes, and freshly baked pastries, and bread. Lunches can be enjoyed in the ranch dining room or as a packed picnic on request, and dinner features multiple courses of prime meats and fresh vegetables, salads and more. Amenities and guest services at theWestern Pleasure Guest Ranch include three gourmet meals a day, a recreation room with foosball and pool tables and large screen television, an upper deck with an outdoor hot tub, a basketball court and horseshoes, and a children’s playground. A modern conference center is available for corporate meetings and business functions and is equipped with the latest audiovisual and sound systems, and complimentary wireless Internet is open around the property. A ranch shop sells essentials along with souvenirs, gifts, and other items, and there are guest laundry facilities with washing machines and tumble dryers. Outdoor activities include mountain biking, sporting clays, wagon rides, bird watching, basketball, hiking, archery, whitewater rafting-adventures, swimming, while winter activities range from cross-country skiing, snowmobiling, downhill skiing, snowshoeing, and sleigh rides. Horseback riding and trail rides are available around the year for all levels of rider. Located 16 miles northeast of Sandpoint, Western Pleasure Guest Ranch is within an easy drive from several local attractions, including the Silverwood Theme Park, the Schweitzer ski area, shopping in Sandpoint shopping, and several activities such as boating and kayaking, golf and scenic driving tours of the region. The Northwest’s largest theme park, Silverwood Theme Park is set on more than 200 acres of land and features over 70 rides, slides, shows, and attractions. Action Water Sports offers a variety of watersports and water-based activities in Hope and Sandpoint and Hope, including stand-up paddle boarding, kayaking, pontoon boating, skiing, jet-skiing and more. Sandpoint City Beach offers magnificent views down Lake Pend Oreille, and plenty of outdoor recreation for the whole family from tennis and basketball courts, a children’s playground, a beautiful beach for swimming, sunbathing, and beach volleyball. Located in the Kootenai Valley, the Kootenai Wildlife Refuge spans 2,774 acres and is home to several species of fauna and flora. The Schweitzer Mountain Ski Resort features over 20 miles of trails with spectacular alpine scenery and see-forever views and plenty of adventurous thrills from hiking and mountain biking to skiing and snowboarding.